In January 2017, new rules came into force regarding the wood used to make some musical instruments. We’ve put the following advice together which we recommend reading carefully as it may affect you and your instrument. From January 2nd 2017 new regulations were introduced concerning all forms of Dalbergia (rosewood), a genus of plants from which many woodwind instruments are made. This includes African Blackwood (Grenadilla), Cocobolo, Rosewoods/Palisander and all other woods from the Dalbergia genus. Woods in the Dalbergia genus are used in many products, from furniture to car dashboards to umbrella handles. Illegal logging by less scrupulous individuals has resulted in rapid deforestation in some countries (mainly of palisander woods rather than grenadilla) . As a result, CITES (the Convention on International Trade in Endangered Species of Wild Fauna and Flora) introduced regulations, bringing the genus Dalbergia to Appendix II. Appendix II status that any product containing these woods require certification. Manufacturers and suppliers will need to obtain permits to import and export instruments in and out of the EU. In the UK, this costs £59.00 each way – if you are based outside the EU and buying from us, the export licence will be added to your basket. We will also need to keep precise records of wooden instruments we stock, and where it originates from. We have therefore updated our invoices to show this information. Any instruments that are affected by the new regulations will be supplied by us with this style of invoice. Customers who have already purchased instruments from us can request copy invoices / documentation that shows this information if required. What if I want to travel with my instrument? Currently, it is our understanding that instruments weighing less than 10kg are exempt from these regulations if they are being shipped or carried for personal use. Instruments being shipped within your own country or within the EU can also be sent without documentation. However, it might be beneficial to check with the relevant CITES Management Authority in the destination country to ensure no extra paperwork is required. CITES have a list of national contacts. This is a developing situation, as the CITES regulation was only confirmed in October 2016, so what is written on this page is very likely to change. The music industry is still developing the administrative procedures needed to deal with these changes. We will be keeping this page updated as we learn more about the process. For further information, please contact your local CITES Management Authority. Classical flute music is dominated by Mozart but there are other lovely pieces to be found amongst his contemporaries and those coming just after him. Not all are household names but as the music is all delightful, it doesn’t really matter! A good place to start is with Louis Emmanuel Jadin (1786-1853). He is best known for his operas so you are always guaranteed tuneful writing. Perhaps one of the nicest of his works for flute is the Sonata in D major Op 10 No 1, Characterised by simple harmonies and skillful use of both instruments, it presents quite a challenge. A vibrant Allegro is followed by a lovely G minor Andante, whilst the closing 6/8 Rondo brings the work to a happy conclusion. Everyone will enjoy this one! If you’d like to get completely off the beaten track then maybe you should consider the Sonata in G major Op 5 No 1 by Johann Georg Graeff (1762 – 1829). This is part of a the series ‘Virtually Unknown Music’ from Roz Trubcher, and proves that there is plenty of good music to be found in unlikely places! Graeff was a ‘professor of Flute’ who settled in England in 1802. This charming Sonata, again in three movements, is short and relatively simple, so it’s ideal for introducing a younger player to the classical style. The note range is small in this piece and there is plenty of interest in the piano part so it’s ideal for performance by two good students. It’s also a perfect introduction to the world of one of the greats. Beethoven’s contemporaries perhaps rated the flute more than he did and as they were not really quite as innovative, their music is more Mozartian in style. Franz Danzi (1763 – 1826) is probably best known for his wind quintets but his Sonatina for flute and piano in D major is a gem. The three movements are charming . A short, slow D minor introduction leads into an airy 6/8 Allegretto which breezes along cheerfully. The central Larghetto is in a lyrical F major and the work ends with a lively Pollacca back in the home key. The whole piece is quite delightful and would make a very happy start to any recital programme. Another happy recital opener is the Sonata in F major by Friedrich Kuhlau (1786 – 1832). This is music for flute players by a flute player so the melodic line dominates, leaving the piano with a more supportive role. The outer fast movements are bright and breezy and the middle Andante flows along expressively in B flat major. Some of the writing here would benefit from judicious transposition up an octave to increase it’s lightness still further, but it’s original moderate range is ideally suited to less experienced performers. Either way it’s lovely! Johann Nepomuk Hummel (1778 – 1837) is worth playing just for his name alone! He wrote three flute sonatas, the best of which is perhaps the Flute Sonata in D major Op 50. This is a longer and more substantial work, with an increased range of notes for the flute and change in the role for the piano to equal partner. Although still in the three movement fast, slow, fast form, the first movement is marked Allegro con brio and you will need strong articulation as well as a good technique to convey it’s power. Unusually, the Andante is in the tonic minor, beautifully unsettled and dark, and it leads straight into the closing Rondo Pastorale. Sunny in outlook but anything but straightforward to play, the writing is peppered with more complex rhythms and sudden accents in both parts, and the virtuosity of the writing means that the pair of you will bring the house down at the end! There is always the occasion when we need to play the music of the really famous but, even so, there is still scope for something a little different to entice us away from their more famous pieces. Franz Schubert (1797 – 1828) is noted more for his songs than his flute music and to be able play a Schubert melody is one of music’s great privileges. Six Lieder, fabulous arrangements by Theobald Boehm of some of his most beautiful songs, are a real treat. Ranging from the expressive beauty of Gute Nacht to the lightness of Das Fischermadchen, these songs allow the flute to follow the contours of the voice really well. If you would like to discover more about musical shaping please start here! Worth the cover price for Standchen alone, this is music for a lifetime. And finally, Wolfgang Amadeus Mozart (1756 – 1792) really did love the flute! The six delightful Sonatas KV10 – KV15 were written when he was just 6 years old and are just a joy to play. They are full of all the wonderful things we so love about Mozart. Simply written, they have interesting rhythms, imaginative harmonies and most importantly, beautiful melodies. It’s true that they are not without technical issues and some do have movements that perhaps don’t work quite so well. However, you will enjoy playing them all and if ever you need a really sparkling start to a recital look no further than KV 14 in C major – it’s a stunner! Browse all Classical music for flute and piano at Just Flutes. There are plenty of alternatives to the Mozart flute concertos, and the Classical period has a wonderful variety of composers who wrote very well for the instrument. The manageable string parts mean that some are ideal to perform with a school orchestra, whilst others are very challenging indeed! The earlier Classical period is rich in flute concertos, most of which are technically less demanding that those of Mozart. Christoph Willibald Glück’s Flute Concerto in G major is an old favourite, and one of the best. The writing has a simple texture but there is still plenty for a flute player to enjoy. You will need to be agile, as the Allegro non molto leaps around, and have a sustained sound to carry the long phrases in the Adagio. The final Allegro comodo is delightfully uncomplicated. The piano reduction works very well here so it also works well as a recital piece. Equally delightful but much less familiar is the Flute Concerto in D major by Rossler-Rosetti, or another in the same key by Anton Fils. These are both very tuneful and provide just the right level of technical stretch to interest a budding soloist. We are lucky enough to have a flute concerto by Joseph Haydn which is brilliant – even if it has now also been attributed to Leopold Hoffman! Another work in D major, it starts with a lovely Allegro moderato which will challenge your low note projection as well as your articulation. The beautiful Adagio has the flute melody floating above the orchestra and the closing Allegro molto alternates semiquavers and triplets to great affect. This is a wonderful concerto – whoever wrote it! Although CPE Bach isn’t strictly speaking a Classical period composer, he wrote perhaps the most difficult concertos of the 18th century. Try the Flute Concerto in G major if you like your music powerful, demanding and compelling. The first movement Allegro di molto is a workout, with long phrases demanding excellent breath control, tonguing and finger dexterity. The atmospheric slow movement is more Baroque in outlook with a gentle lyricism, but the closing Presto is perhaps even more challenging than the first movement. Extended passages of large leaps, all articulated, will test even the best players. The D minor Flute Concerto is also high-powered with mighty outer movements and a slow Andante of wonderful tenderness. These are standout virtuoso concertos that will bring the house down. A more familiar figure is Francois Devienne who wrote a number of concertos for us. Flute Concerto No 2 in D major is one that will challenge your finger technique considerably. Devienne approached composition purely from the standpoint of player, so the accompaniment is merely a support for the soloist. This consists of the customary mix of scales, arpeggios and sequences that are characteristic of his writing. The overall effect is pleasing though, and the change of key to D minor for the Adagio adds extra interest. This concerto is full of notes, and will test your flute playing skills considerably. The writing is darker and more dramatic throughout with a first movement that changes frequently from minor to major. The second movement Adagio uses the full compass of the flute to weave its melodic line, and Müller uses an unusual theme and variations structure as a finale. This sparkles despite the predominant minor key, and you will need very good articulation to fully convey the character. It’s a good piece, one worth exploring. All of these fine works will please both you and your audience. Don’t forget the cadenzas though – some editions include them, but it’s actually much for fun to write your own! Buy flute concertos – and other Classical flute repertoire – at Just Flutes. When it comes to testing out a new flute, the experience can be overwhelming – what is the best way to test a new flute? We’ve put together our top tips to help you narrow down the choice and find your perfect upgrade flute. Whether you are looking for a step-up instrument or a professional model, follow these pointers to help you on your way! It’s natural to be excited about trying new flutes, but don’t test one of the new flutes with Flight of the Bumblebee quite yet – hold back! Get your chops warmed up on your existing flute with some long notes first. This has the added benefit of giving you a reference point for what you are comparing the new flutes to. Once you’re warmed up, hold off the tunes for a little longer. Play some slow scales on each flute – this will give you an idea of how the instrument sounds across its entire range, and may expose weaker areas. This is something that can be done while you are playing scales. Can you play the low register with a strong, full sound? Can you play high notes quietly and sweetly? How responsive and clean is the articulation? Again, simple scales played slowly and tongued will give you a good idea. Also, try without tonguing (diaphragm only). Play low, simple tunes (good ones are Fauré’s ‘Pavane’ or ‘The Aquarium’ from ‘Carnival of the Animals’), and aim at a very hollow, open sound. Go up an octave and see if you can produce the same sort of sound. It is very important that an instrument is capable of producing a similar quality of sound throughout the full range. Next, try a much harder sound with lots of harmonics, again in different octaves (Moyse 24 Easy Melodic Studies No. 10 – strong and trumpet like, is ideal). A listener comes in useful when testing the projection. Some instruments appear to play loudly close up, but cannot be heard at the back of a concert hall. Others don’t sound loud close up, but the sound travels better – this is projection, and can be very deceiving. A good way to test this is to compare instruments while you have a listener outside the room with the door closed: which sounds louder? You may have a pre-conceived idea of your ‘perfect’ instrument, (in terms of sound, feel or any other area really!). But – take our word for it – it probably doesn’t exist! A new instrument can’t compensate for shortcomings in your playing – only hours of careful practice can do this. But a new instrument gives you the potential to improve your sound in all areas – practice will then make this a reality! It’s lucky for us flute players that jazz pianist-composer Geoff Eales and the talented Andy Findon are such good friends. As a direct result of their collaboration for the CD The Dancing Flute, we now have some of the best flute jazz music to play for ourselves. Eales studied composition with Alun Hoddinott and wrote award-winning large-scale orchestral works before he became more interested in jazz. His stellar career since then has enabled him to carve out a niche as an improviser, and it is these two aspects of his style that underpin all his works for the flute. Eales certainly knows how to write dreamy melodies. Song For My Mother is beautiful, with a simple tune over a sustained accompaniment. There is no huge technical challenge here, but the 16-bar piano intro sets a relaxed ambience for the whole piece. There is a real feeling of freedom in the flute writing which is quite enchanting. Remembrance is in a similar style, but the minor key adds darker sonorities. This is captivating, drawing you in as you play – absolutely lovely! If you’re in the mood for something upbeat, Eternal Dance is rhythmically tough with 7/8 alternating with 5/4 in the manner of Bartók (the metronome marking is 162, so this is a real workout!). In a completely different style is Elf Dance. Here three fast and furious sections alternating 6/8, 3/4 and 5/4 contrast with something slightly more lyrical to produce an exciting piece that’s always on the move. Farewell Patagonia is different again with a driving tango rhythm taking us to South America. In all of these works the piano is so important, and there are frequent improvisatory-style piano introductions and breaks. This makes the performances even better! Geoff has also written repertoire for other members of the flute family: there isn’t much original music for penny whistle, so In The Eyes Of A Child is very special. A simple lullaby in waltz time, this is a piece that wonderfully captures the innocence of youth. You can of course play this on the flute but it really does sound great on a quality whistle! This could not contrast more starkly with Force 11 for piccolo and piano. The performance direction for the opening improvised section here is manically and atonally and this leads on to the notated main body of the work that is marked demonic! This will stretch even the most accomplished player with its extreme range and relentlessly changing times. Intensely fun! For low flutes, Geoff has written us two gems. Lochria’s Rhumba for alto flute and piano is a real fusion of styles. The mysterious melody is based on the Locrian mode and weaves its way enticingly around the lower reaches of the alto. The accompaniment adds a slow rhumba to the texture. The result is another laid-back and free work that casts an evocative spell over the audience. His work for bass flute and piano is Ice Maiden, another hypnotic piece which is again really sultry. The pulse is more clearly defined here with gentle syncopation in the piano allowing the sensuous sound of the bass flute space to sing the rich melody. Both these pieces are extremely well crafted for each specific instrument, using it to its maximum effect and reflecting the individual character. Jazz for flute doesn’t come much better than this. Geoff and Andy – thank you! Geoff Eales’s music is published by Astute Music and is available from Just Flutes. Searching for Christmas music for your flute choir’s festive concert? We’ve hand-picked six great seasonal books that every flute choir should own. 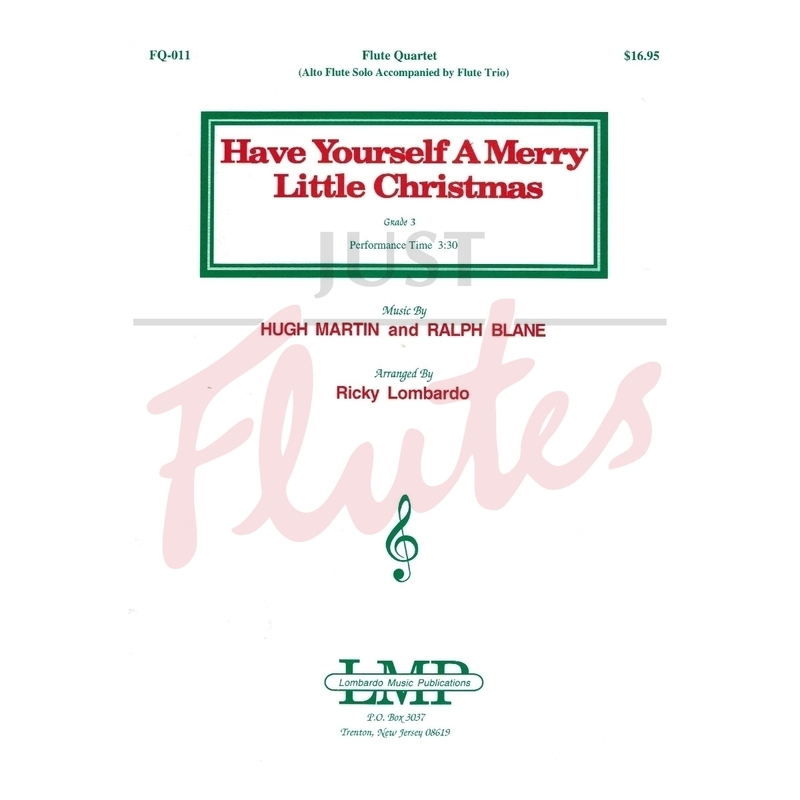 Ricky Lombardo’s arrangement of Have Yourself a Merry Little Christmas gives the solo to the alto flute, with three accompanying flutes providing a sumptuous backing. This is a masterstroke of arranging and really works, giving a lucky player a fantastic chance to shine and sending the audience home happy! Nancy Nourse’s transcription of Frederick Delius’s Sleigh Ride for piccolo, 4 flutes, alto, bass and sleigh bells is a chance to play less familiar music. This is an early Delius work which delivers the crisp clarity of a snowy day together with the pulse of a horse-drawn sleigh. The bells add a lovely touch! 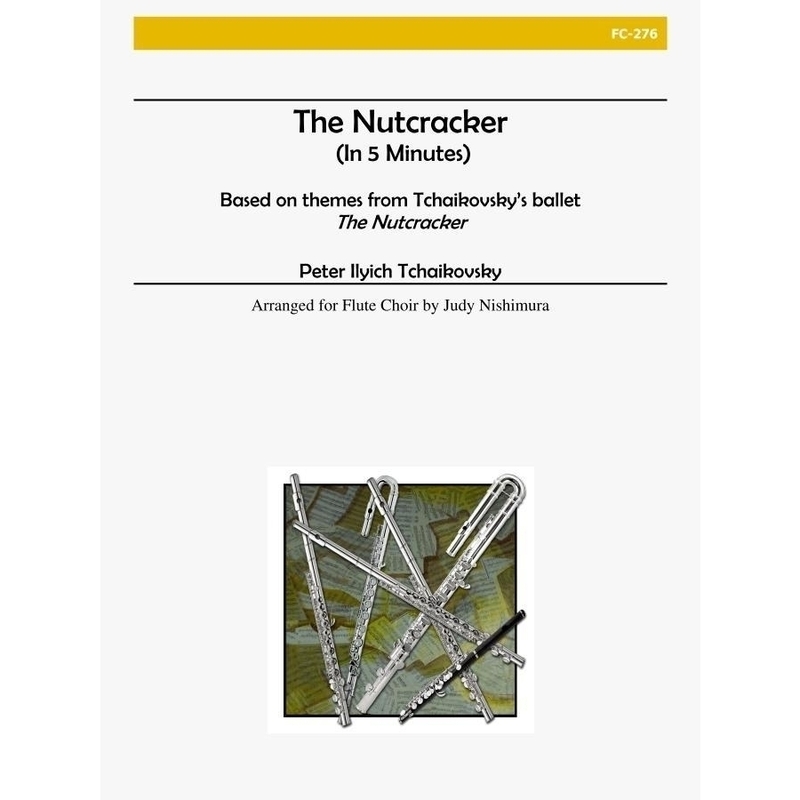 No review of Christmas flute choir music would be complete without a mention of The Nutcracker (in 5 minutes). Judy Nishimura has crammed your favourite dances from the ballet into a very short space of time – and it’s not easy! Your flute choir needs a piccolo, four flutes, alto, bass and contrabass for a successful performance (but she has also produced a version for flute and piano so no-one need lose out!). 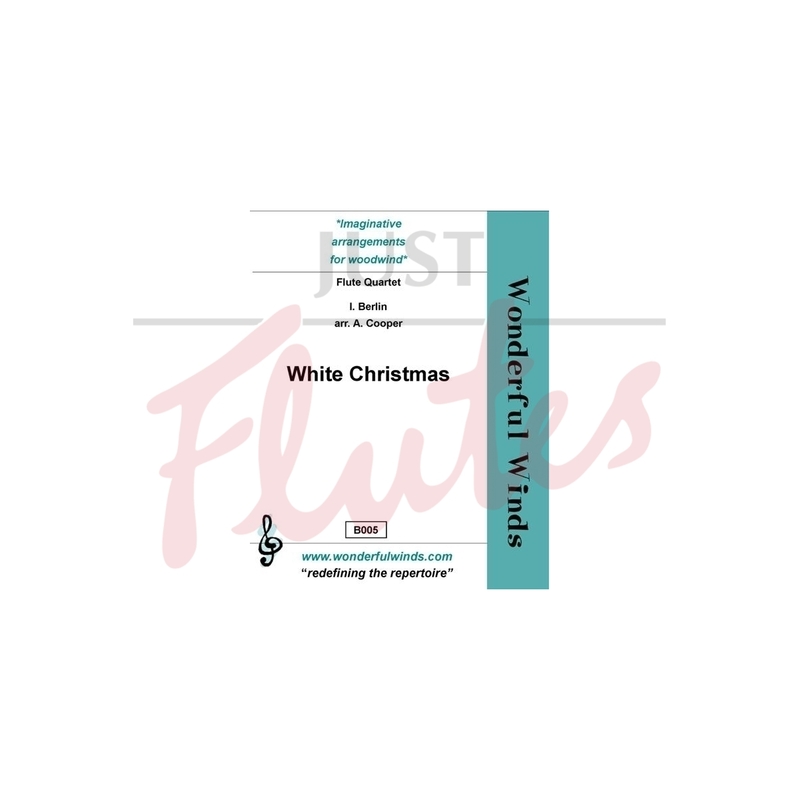 Irving Berlin’s White Christmas in the Wonderful Winds catalogue is written for four C flutes. This clever arrangement perfectly fills a short slot in your concert and your audience will enjoy spotting the hidden traditional carols. Includes three easy parts, with a trickier jazzy fourth part. Robert Rainford’s two-volume Christmas Collection (Vol 1, Vol 2) will provide you with 14 best-loved traditional carols, including Once in Royal David’s City, Away in a Manger and The Holly and the Ivy. Although scored for flutre choir with every kind of flute from piccolo to contrabass, this collection works well on four C flutes too. Teachers will be able to use this book in so many different situations – a life saver! If you’re looking for something a little different why not try Simon Desorgher’s Jingle Bling. Fun to play, it’s written for instruments in C only (piccolo, 6 flutes and bass) it’s basically in C major and it features a popular Christmas tune (can you guess which one?!). There is a complexity between the parts due to the canonic nature of the writing, so although none of the parts is overly difficult, it will take some putting together. The ending is a little unorthodox, but this is a great piece to spice up your Christmas concert. Jingle Bells will never be the same again! We’ve chosen these six best-selling books from our Christmas Music section, but there is much more good music available for the festive period, and something to please everyone. Merry Christmas! We are often asked in the shop: “why has my new flute turned black?” One moment your silver flute is nice and shiny. The next, a cloudy colour all over. What’s going on here? Silver. Chemical symbol Ag, atomic number 47. Used for thousands of years in ornaments, utensils, trade, and as the basis for monetary systems. In this blog we have already covered the allergic effects silver can have on the human body, but we haven’t yet covered the effects that the human body and everyday circumstances can have on silver. Over time, silver reacts with air to produce a thin surface layer of oxidisation in the form of silver sulphide. Depending on the type of silver used, this tarnish can appear as black, brown or cloudy grey patches. Silver-plated flutes are the norm for student to intermediate level instruments. These flutes have a layer of 100% pure silver to give a bright finish. Sterling silver is the most usual metal for higher-level and pro flutes, and is formed of 92.5% silver with 7.5% other metals, often copper (100% pure silver is too soft to use in a musical instrument). With this addition of copper, you are weakening the silver’s resistance to tarnish. Some flute manufacturers, primarily those in the Far East, use a process called “flash plating” on solid silver flutes, which involves silver-plating (again, with 100% silver) on top of the Sterling silver. This results in a brighter finish than Sterling, and has the benefit of slowing down the tarnishing process. Many American flute companies do not use flash plating, so these flutes will react differently. If there is a spell of hot humid weather, the tarnish can appear much more quickly, sometimes overnight. As a result, players who move from a Japanese flute to an American flute are often surprised to find thatf their new flute needs more regular polishing than their old one. Acid in fingerprints. This varies from individual to individual, but it is a fact of life that everyone’s skin’s oil contains acids. Some people have more than others (which is why some people can turn a flute black almost by looking at it! ), and these people need to take more care with their instrument. Heat. As with most chemical reactions (think back to your school chemistry lessons spent with a bunsen burner), heat speeds up the process, so the tarnishing process is often faster in summer. Moisture. Your breath contains hydrogen sulphide (the main ‘tarnishing agent’ in air), and any moisture left in the flute or case will speed up the tarnishing process. While you cannot escape tarnishing entirely, you can help keep it at bay. This is why we recommend thorough cleaning of your flute both inside and out after you finish playing, and keeping it in its case when not in use. You can buy anti-tarnish strips (which work by absorbing the hydrogen sulphide in the air) to slow down the process, but at the end of the day, it is nothing to worry about and certainly doesn’t mean there’s something wrong with the flute or the quality of the silver. In fact, it’s a sign that your lovely shiny flute is definitely silver! Unless like some people, you find you prefer the tarnished look (trust me they’re out there), a silver polishing cloth will usually do the trick. Tetractys Publishing is the brainchild of Carla Rees, home to her own compositions and arrangements as well as the many pieces that have been written for her. The range of material on offer here is vast. Obviously the catalogue is heavily weighted towards contemporary music for low flutes as this is Carla’s main area of expertise, but there’s much else to tempt you as well. Her adaptations in two volumes of the JS Bach Cello Suites [volume 1] [volume 2] for alto flute are a wonderful way of developing skills whilst using great music. Breathing and stamina are often a problem on low instruments, but if you can manage these it will really help. Aside from suggested articulations, the music is left for you to edit as you wish and you will be able to return to them many times, always finding something new. There are versions [volume 1] [volume 2] adapted specifically for bass flute too. 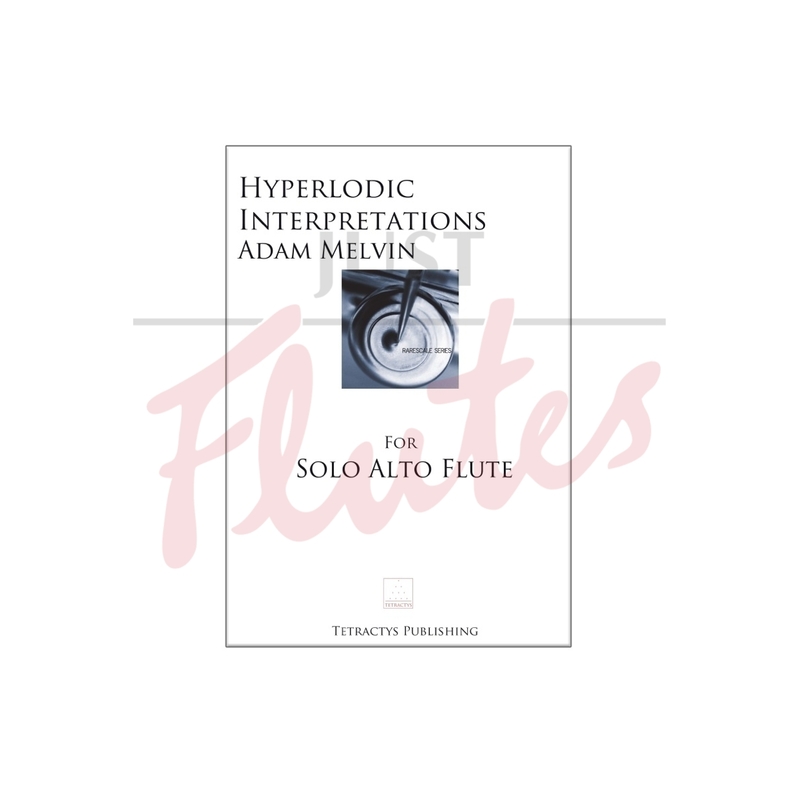 One of the most interesting pieces of contemporary music for solo alto is Adam Melvin’s Hyperlodic Interpretations written in 2003. Influenced by the jazz musician Eric Dolphy, the format is slow introduction (poco rubato – aggressive) followed by a rhythmic main section which is always driving forward. A much slower jazz melody follows before the momentum increases to the end. The fluctuating time signatures allow for flexibility in the interpretation and the basic multiphonic and portamento techniques are very approachable. If you are feeling adventurous, give this a try. Another winner is Moss Garden by Michael Oliva for bass flute and electronics. This wonderful piece is all about texture (‘an exercise in simplicity’) with the slow moving flute writing merging into the accompaniment to create the magical world of a Japanese garden. The electronic part is supplied as a download and you will need some basic equipment for performance. It’s so worth the effort though as this unusual piece would enhance any flute recital programme. If you fancy something a little more mainstream whilst staying with living composers, Attitudes by Jon Jeffrey Grier for 2 alto or C flutes might fit the bill. This is a very striking duet which aims to ‘capture the states of teenage people’. In three movements, the writing is quirky, and at times virtuosic. Although there are no advanced techniques to master and the rhythmic footprint is mainly straightforward, the challenge is in the dovetailing of the parts to blend as one. ‘Flirty’ is rather fragmentary with short rhythmic figures dancing around each other, whilst ‘Pouty’ uses tremolando and trills to provide the colour. ‘Ansty’ is an exciting whirl of notes which will bring the piece to a rousing conclusion. Another work for virtuosos but from a completely different world is Carla’s own arrangement of The Flight of the Bumblebee by Rimsky-Korsakov for piccolo, flute and alto flute. This is a brilliant romp which is just so great to play! Quatraine II for 3 piccolos and alto flute is one of Carla’s original compositions. Her aim was to pit ‘the chattering piccolos’ which are given angular leaps and short phrases against ‘the sonorous tone of the alto’ with its mainly melodic line The result is a perfect fusion of sounds that perfectly conveys the differing characters of the instruments. Whilst seeming ultra-modern, Quatraine is very approachable to play, giving you the best of all worlds! Recent publications have included a large range of mainstream works that Carla has transcribed for ensemble. Again, the emphasis is on low flutes, so the result is completely different to that of more conventional arrangements. Crucifixus in 8 Parts by Antonio Lotti is scored for 6 altos and 2 bass flutes with contrabass if available, but three alternative C flute parts are also included. Tuning, balance and stamina are the issues here, but this simple work can sound really effective if played well. More conventionally, the Quantz Concerto in G for two flutes is scored for 2 solo flutes, 2 flutes, 3 altos, bass and optional contrabass. The concerto grosso feel of this has been captured skilfully. The beautiful slow movement in particular contrasts unison tutti passages with intricate solos accompanied by a simple bass line. Another winner is the arrangement of the Donizetti Flute Sonata for solo flute, 2 flutes, 2 altos and bass. Again Carla has transcribed sensitively, spacing the parts to allow the solo flute to carry over the main group. The solo part is original, and all the intricacies of the piano writing are seamless integrated into the other flute parts. This is an incredibly good way to showcase a lovely but rather neglected work. If you would prefer to play an original work, Rainbow Measures by Rob Keeley, (2 piccolos, 4 flutes, and 2 altos) is another effective work that will challenge your ensemble skills. Lasting 9 minutes and ‘imagining each player as the colour of a rainbow’, the swirl of notes, rhythms and textures coupled with varying tempos and extreme dynamic changes results in a very colourful piece that will be a joy to accomplish. The Tetractys catalogue also includes many of the works written for Carla’s flexible group Rarescale. 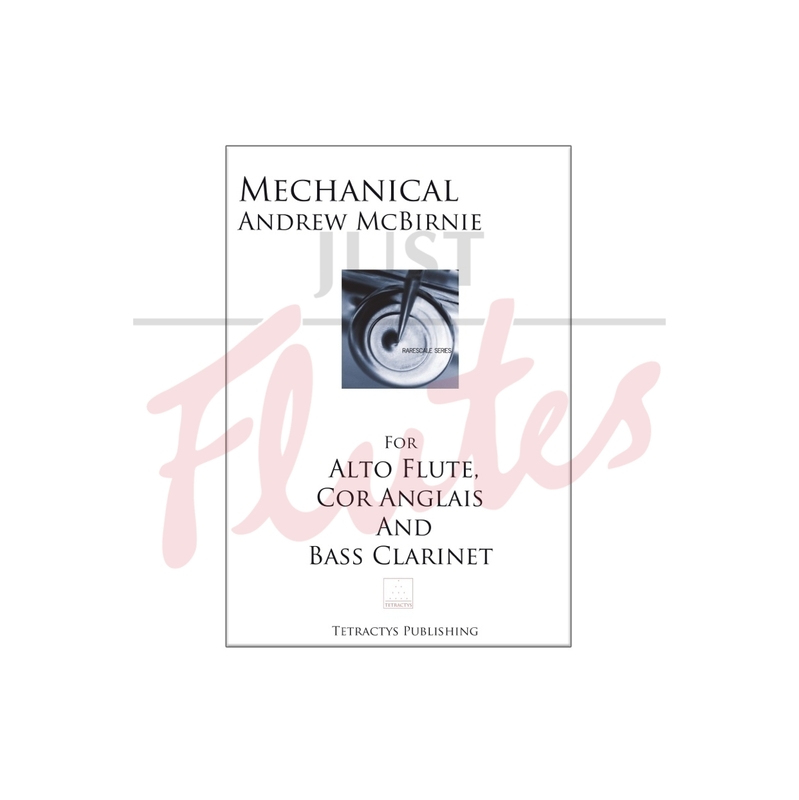 One of the most compelling of these is Andrew McBirnie’s Mechanical for alto flute, cor anglais and bass clarinet, a short 2 minute piece in which continuous semiquavers passed around the group are punctuated isolated notes and rhythmic cells. The exactness of the writing really conveys the predictability of the machine and is utterly mesmerising. Tetractys is so much more than just ‘niche music’. Delve further and you’ll uncover gems galore and there’s something for everyone. Are you inclined to criticize yourself for the smallest things? Are you overly concerned about what others think of you and your playing? Are you fearful of getting it wrong? Are you stuck in a rut? It is very likely that we all have some emotionally charged reactions to these questions in some form or another. Their effect on our musical lives can shape our playing and alter the pure enjoyment we can attain from one simple note. When I first started playing in orchestras I remember it being one of the most stressful things in my life at that moment. You see, at the beginning, I (and I imagine lots of young musicians) felt I had something to prove. That I was worthy of sitting in that chair. So, I focussed on being an accurate player, and what that meant to me at the time was putting all the right notes in the right spot at the right dynamic and in tune. With that mindset, I never achieved this goal. There was something inside of me that made me want to play a phrase a certain way which in turn made it more difficult technically. Therefore, as every concert came up I’d be determined to have an accurate night. At the end of the concert I’d decide that the next night it was going to happen and so on. Then, something changed somewhere. I forgot about my long-standing challenge and all it took was one concert where that focus wasn’t in my mind. It worked. It was an accurate concert, and also, musical! I realised then that my one-sided focus to be accurate was not going to work for me because my musical side was one to take risks and react to what others were doing in concert. Once my mind had switched to simply enjoying the music-making I found that the accuracy also became consistent. This led to a freedom of feeling and thinking which runs through all the repertoire that I play. It takes me a long time to come to an interpretation of a piece simply because it’s always changing as I discover more and more sounds, colours and moods. At times I incorporate so-called “extended techniques” in old repertoire because it gives light to a more musical sound. These are not things I learned from school, or from reading a textbook. These are things that came from imagination, and, happy accidents in the practice room. So from there, every “mistake” I make in practicing is merely an opportunity to see if I hear something else in a phrase. This constant search for colours in sound can be somewhat addictive! Yet, for me, it is the way to tell my story when I play for others. A natural extension of this is my belief that everyone has something to say. For some of us it could be bottled up inside and we may not even know what it is yet! I use some acting techniques in workshops to help free this creativity in others. For we are all actors the minute we step on stage to deliver our story. At a crossroads in my musical life, I sat trying to decide which direction to take my career. With so many inspiring opportunities surrounding us all, one would think this would be an exciting pastime. Unfortunately, I was filled with negative energy – there was a lack of passion towards music and disappointment and sometimes disgust directed toward myself and my playing. I thought I had no idea how to get to my goals efficiently and positively so I just stared at the seemingly unattainable, building my own walls around me and giving myself permission to expend less energy towards my goals. I thought of quitting. Then I began to consider why I chose the flute in the first place – simple enjoyment of the instrument and the music itself. This idea had become clouded during the busy years of musical schooling in which I focused on what I ought to sound like and what others thought of me. I dusted the idea off, made it the basis of every aspect of my teaching and playing, and let it guide me as I determined how to approach problem solving on the road to my goals. The difference in both my attitude and the attitudes of my students was incredible – we still worked hard, still competed, still performed, still obsessed over small mistakes, but the approach, both intellectually and emotionally, was hugely different and far more positive. We spend so much time trying to attain perfection (whatever that really is in the long run) that we forget to look at the beauty we offer in each moment. After intense criticism over the smallest things, how do I feel? Is this helping me get to my goal? Why am I being so critical? Is my fear of getting something wrong based in shame or embarrassment within the view of others? Where does this comparison come from? Do I feel my offerings are not worth as much as others? Why should another’s offerings define my own? Asking these types of questions, even if you find out you don’t know every answer, is the first step to understanding yourself and therefore having compassion for your challenges rather than frustration and shame. One of my favorite teaching moments after walking through questions like these is seeing the emotions on a student’s face when he or she fully realizes that not only is there nothing to be ashamed about (relief) but that they do know the answers and have every tool to lead them to success (pride). Opportunities for one-on-one coaching in topics dedicated to these challenges as well as discussions with people just like us who can provide anecdotes like the ones above make up one of our favorite aspects of being musicians: the support within our community. Expand your network and open your mind to new approaches by surrounding yourself with positive energy and supporting yourself in mind and body. Whole Musician retreats bring all these aspects of musicianship and more into our awareness with the aim of making us all happy and healthy musicians. We will be presenting workshops on these ideas and more in London from August 26-28. If anyone is curious about what goes on at Whole Musician retreats, by all means look for our registration information online at WholeMusician.net.